Clinique is one of the biggest cosmetics companies on the face of the planet. They produce everything from simple lotions to skin lightening creams and beyond. They’ve been known for their high-quality, extremely effective beauty products for many years now. As of late, their acne treatment products have been gaining a lot of traction. People are beginning to realize that Clinique, although a bit cheaper than major acne systems like Obagi or Dermalogica, has a lot of useful, proven-effective products for acne. One such product is the Clinique Acne Solutions 3-Step Clear Skin System. Below we review this kit in full detail. 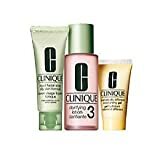 Featuring three full-size bottles of their most popular and effective acne products, the Acne Solutions 3-Step System from Clinique is literally an all-in-one acne-eliminating package that really offers a lot of bang for your buck. The system consists of a powerful foaming cleanser that leaves your skin feeling fresh and clean, a lotion that moisturizes and makes skin buttery smooth, and a uniquely-designed clearing moisturizer that rounds off the set. The cleansing foam is a gentle, yet potent, facial cleanser that completely eradicates your skin of dirt and other icky stuff that leaves your skin feeling grimy. As with any acne system, this is probably one of the most important steps. After all, without clean skin there’s no way to banish acne and bacteria to the bowels of hell where they belong. This product is a full 4.2 ounce bottle. The next step is the clarifying lotion. This is an alcohol-free lotion that is designed to help exfoliate the skin, removing damaged and dry skin cells. It’s great even for the most delicate skin and leaves you feeling smooth as a baby’s buttocks, plus it makes skin look brighter and healthier. The included bottle is a full size of 6.7 ounces. Finally, we come to step three – the clearing moisturizer. This is a very light, medicated moisturizer that works well for getting rid of acne and preventing additional breakouts. The moisturizer hydrates the skin well enough to eliminate dryness while at the same time creating a protective layer over your skin that blocks bacteria and other general nastiness from entering your pores. This is the primary step that actually targets pimples and significantly reduces acne altogether. It even helps clear up redness. This product is also a full-size bottle at 1.7 ounces. I love Clinique, and getting it on Amazon is wonderful. You just can’t go wrong here. Your face will love you for it. Just buy it. It’s a little expensive, but this is your face we’re talking about. It’s worth it. My daughter had ordered the Clinique system. She is very satisfied with the product. Ready to Try This Acne Solutions System? Looking for the finer details of what the Clinique Acne Solutions formula consists of? We totally get that! In fact, we applaud you for being proactive and doing proper research of a beauty product before purchasing it. That said, below we’ve provided a list of general ingredients that are typically found in the Acne Solutions products. For a comprehensive list of the ingredients in the various steps of this acne treatment system we recommend looking it up on Drugs.com where you’ll find a complete listing of all substances as well as information about what each one does. Perhaps one of the most powerful and useful marketing methods in the world is word-of-mouth testimonials. Real reviews help paint a clear picture of how well a product works. When it comes to beauty products, these public evaluations are an invaluable source of additional information for consumers. The Acne Solutions 3-Step System is relatively new, however, and it doesn’t have a ton of reviews just yet. The individual products have been around for a while and have had numerous reviews posted online, but the entire kit only has about 15 so far. From those 15, though, it has received a 4.3 out of 5 star rating and more than 82% of users highly recommend it. Several people stated that this is a top notch skin care routine for taking care of acne. Some claim that this system helped clear up their acne in less than a week. Others said that after dealing with severe acne for several years this Clinique acne treatment system has helped tame their breakouts immensely and given them back their confidence in their skin. This acne kit is available at a bunch of different stores including Wal-Mart, Walgreens, CVS, and Target. If you’re a bargain shopper, though, you’ll have better luck finding it at a reasonable price online. Amazon, for example, has it for a great price right now and offers superb customer service. Equate 3-Step Acne System Review: Inexpensive But Does It Whip Acne?